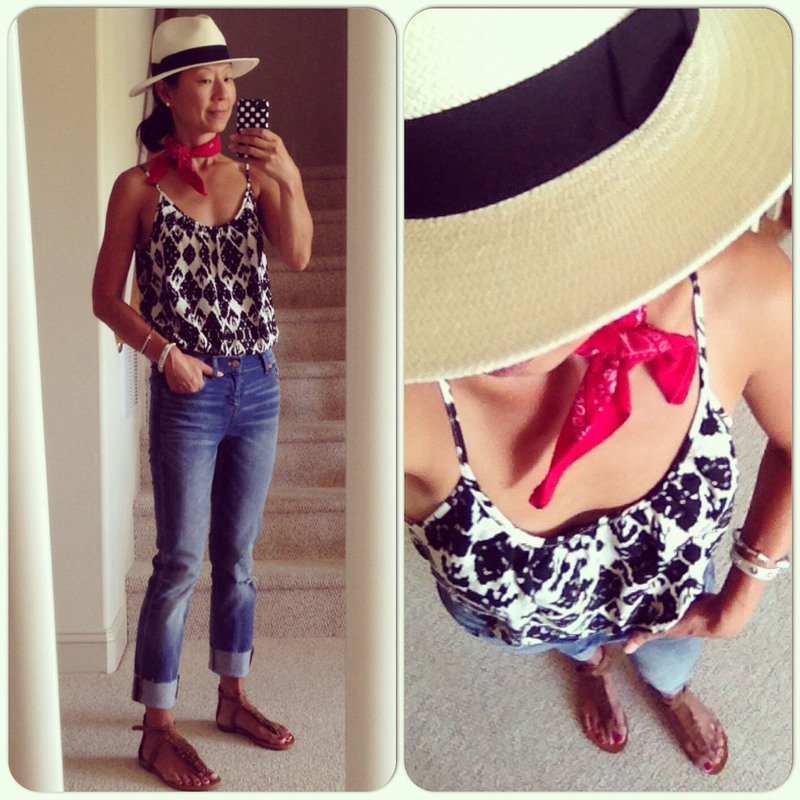 Now that some of the hottest days of the year are upon us, Adrienne of The Rich Life in Wine Country and I thought a “How I Wear My” devoted to straw hats made stylish good sense! This was such a fun post to put together because everyone looks so good, all smiles and hats! What a treat to see everyone at their summertime best. Enjoy! I think this is such a clean and stylish ensemble on Adrienne and I love how both the hat and the leather wrap bracelet give it a bit of edge. Trina (and family!) of Tea Time With Trina. I love this picture so much. I think it is my new favorite photo of Trina! 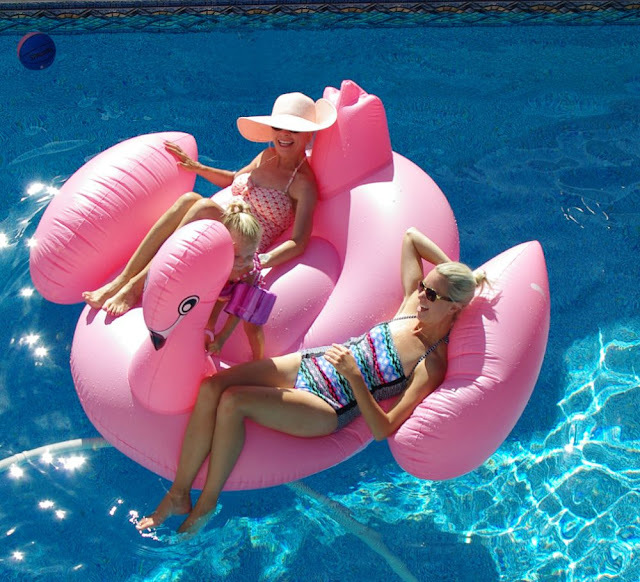 What an adorable and refreshing take on summer—Trina so lovely in her pale pink wide-brimmed hat and enjoying the pool with her beautiful daughter and granddaughter. Isn’t this a great shot? 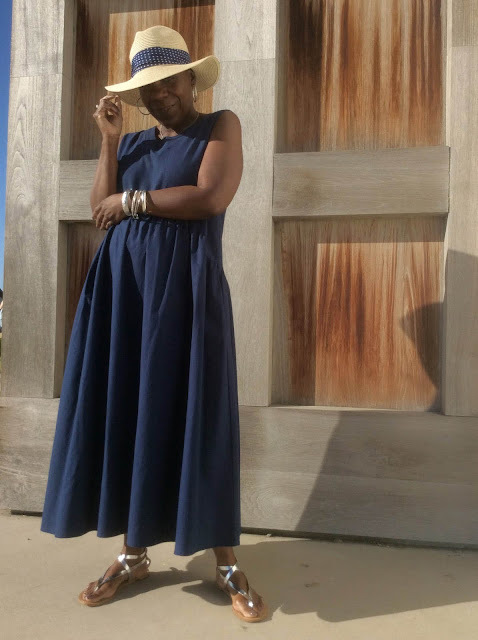 Our good friend Sheree of It’s Not That Deep has been busy with her new vintage clothing shop, as well as her online shop, but took time out to send us this fantastic picture of herself in a big floppy straw hat. She says she thinks it’s the only time she has worn a hat! I love the beachy summertime vibe of this look and I’m crazy about the bag. 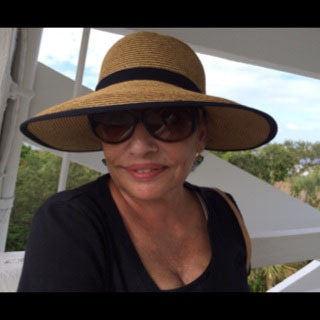 Sandy writes, “This is my favorite straw hat that I wear almost everywhere - to the beach, the park, etc. I love it because it travels well – it’s packable! So I don’t have to worry about ruining its shape. 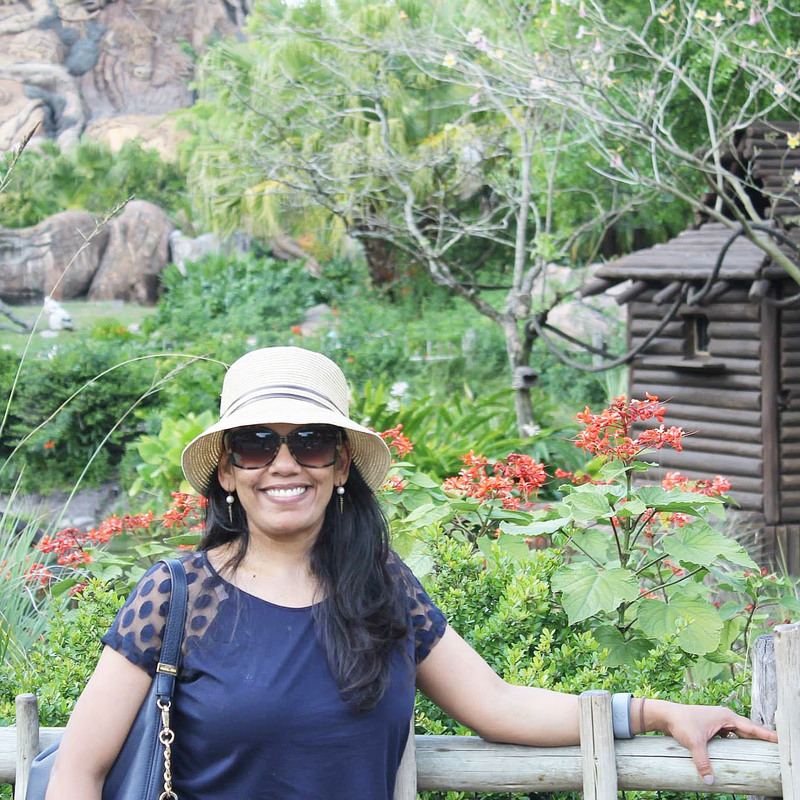 This picture was taken at Animal Kingdom in Disneyworld. I just love the beautiful background! What a great picture of Sandy looking pretty darn elegant while at a zoo within a world-famous amusement park! I love her earrings and the polka dots on the sheer sleeves of her blouse, don’t you? I just love this look on Merci—I think the shorts look so good with neutral high-heeled sandals, a white tank and that very lovely hat! I think Helen brings up a great point about how hair needs sun protection and that the color of it can effect how hot your head gets. I love this entire ensemble on her, it’s such a great summer look! I would add that the silver sandals and polka dot hatband also help add to one fabulous statement on Glenda. I love this look on her! I love this dreamy look on Dawn Lucy, definitely romantic enough for a garden wedding, either as a guest or as the bride! What a gorgeous and romantic look on Suzanne! Have a look at the details of the hat she made, below. The lovely floral hatband that Suzanne made! This is such a terrific look on Jane. 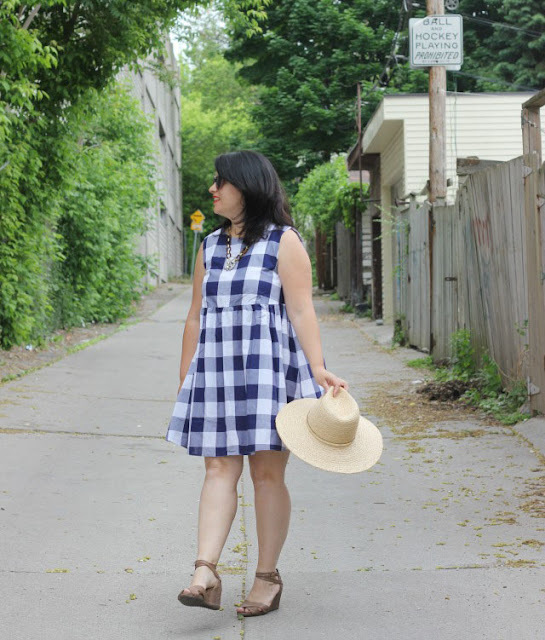 I adore that navy and white gingham dress, the big necklace, and those wedge sandals. The hat in her hand makes the whole ensemble so flirty and even more feminine! Lulu of The Peace & Positivity Preservation Society. 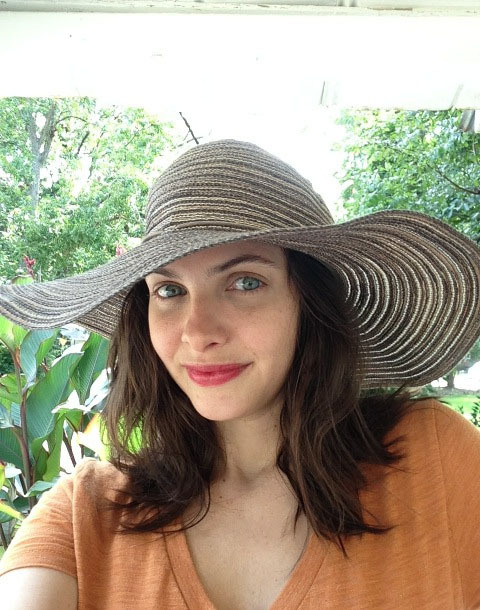 Our new friend Lulu of The Peace & Positivity Preservation Society looks like the epitome of simple summertime beauty with a striped wide-brimmed hat, orange T-shirt and sheer lip color. Who says you need a lot of anything to make an impact? I can’t imagine a hat post without Tamera and I love both this super glamorous look on her and the story of her hat. I think it is safe to say she is definitely living That Life! 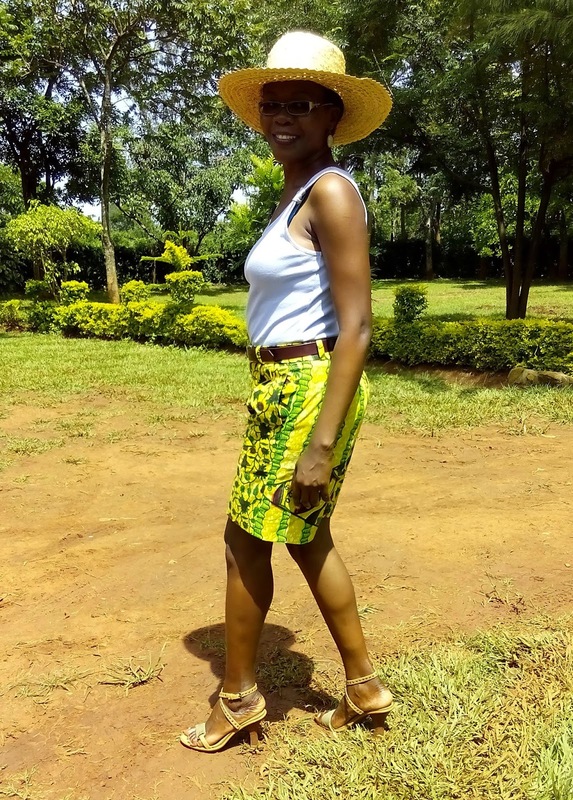 I am thrilled that my friend Rosie is joining us for the first time with this photo, looking so glamorous and gorgeous in her straw hat and sunglasses! I like this casual art gallery visit look on Teresa and I also really like this just as a photo showing Teresa and the Manhattan cityscape behind her! I really like this color combination on Nora, she really knows what colors suit her best, and this is an outfit I can’t imagine without the terrific hat! Cheryl of Northwest Mountain Living writes, “I love hats but don’t have nearly enough. In this picture I am wearing a hat from a local boutique called Mountain Monkey Business! I am wearing a vibrant green tunic, denim shorts, and colorful sandals. To accessorize I am wearing the pearl necklace my husband got me for my birthday this year (turned 55!) and carrying a straw bag. It was a very fun outfit to put together! I really love the gorgeous hat and pearl combination on Cheryl in this picture, especially with the green tunic and that oversized straw bag. Foxy and fun at 55! 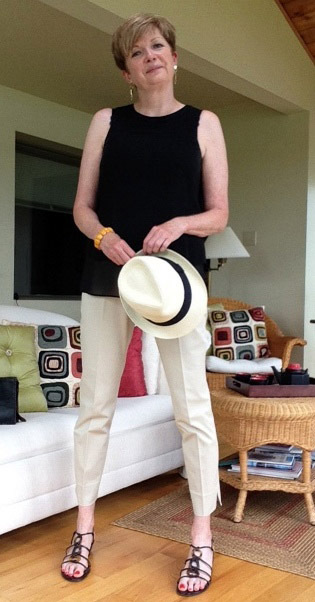 Alice of Happiness at Mid-Life says she and her family go to a lot of summer concerts in the park and she wore this outfit to one of them, featuring a hat by Banana Republic. 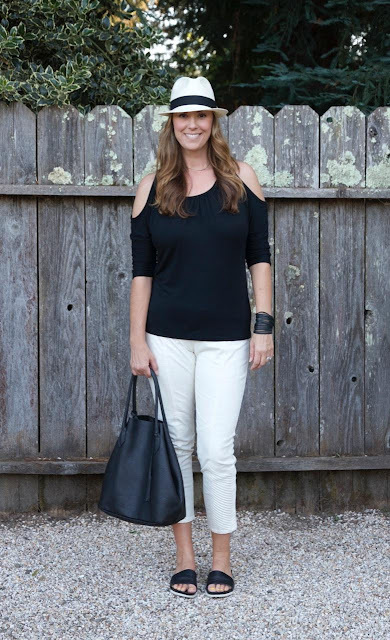 I love the casual vibe of this ensemble on Alice and I am especially enamored of her black and white hat! April of Ms B in the Bay Area. Just like Helen, above, April reminds us of the need to protect our hair from the sun. I like this look on her and since there is plenty of room on that outdoor sofa, wish I was sitting next to her with a similar drink in my hand, getting to know her! Ana’s look is my idea of low-key summertime glamour, both feminine and fun. This is one of my favorite color combos in summertime and I think a pale hat with a black hatband is perfect addition to this look! 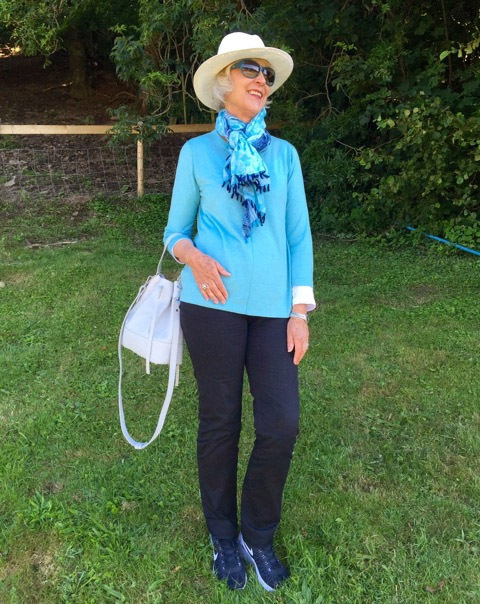 Josephine of Chic at Any Age joins us looking so cool in these turquoise blue shades (I especially love that scarf) capped off by her wonderful white hat! 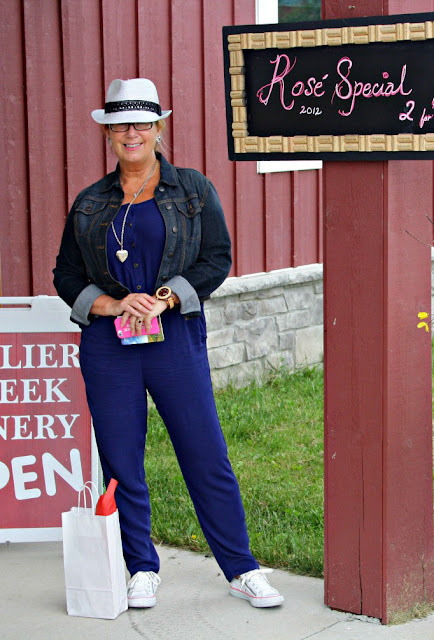 What a fun look on Linda, I like the two blues together and I can’t imagine this ensemble without the hat! I don’t own actually own straw hat (gasp! ), but when my friend Gwynne snapped these photos on Coney Island last year for “How I Wear My: Summertime Picnic Look” she handed me her own wide-brimmed hat halfway through so I could try out the look. I am keeping my eyes peeled for a hat with a wide brim to keep the sun off my face. Maybe I can pick one up on sale at the end of summer! I don’t know about you, but I seem to gravitate towards the same pieces for two summers in a row before hitting the refresh button. So that means I am still loving my Banana Republic seersucker jacket I bought last year, as well as a J. Crew palm tree T-shirt I was able to get on sale late last summer. The necklace is also J. Crew, from several seasons ago, and the flag pin is a vintage Avon brooch that my grandmother gave me many years ago that I absolutely love. 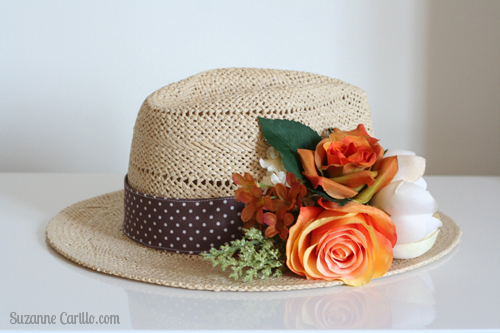 A favorite summertime combination for 2015! I hope you are enjoying both your hat and the season! As the summer begins to wind down let’s have some fun with tassels! They can run the gamut from light-hearted to glamorous depending on whether you have them dangling from your bag, adorning the front of your shoes, or hanging from a long necklace. Find your favorite tassel and let the styling inspiration begin! Join us in September for “How I Wear My: Tassel” by sending a photo to howiwearmy@yahoo.com by August 31, 2015. 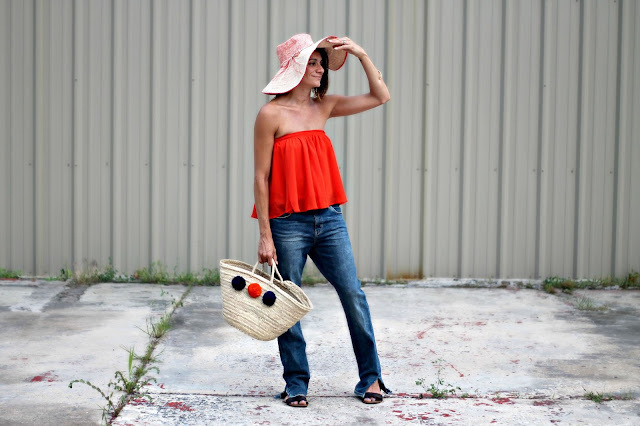 Do stop by over at Adrienne’s to see even more wonderful looks featuring straw hats. And THANK YOU to all the fine foxes who joined us this month. This was one of our biggest turnouts yet! Oh I love this picture of you at Coney Island, Jill! You look amazing and what a great shot! I also love Trina's shot of three generations of beauties in a pool floaty! What a fun HIWM! Always a pleasure being part of the gang! You look great Jill...I love your picture and there are some great looks here as always! Love the Coney Island picture, you look terrific in the seersucker stripes & hat! Hope you are enjoying your summer. 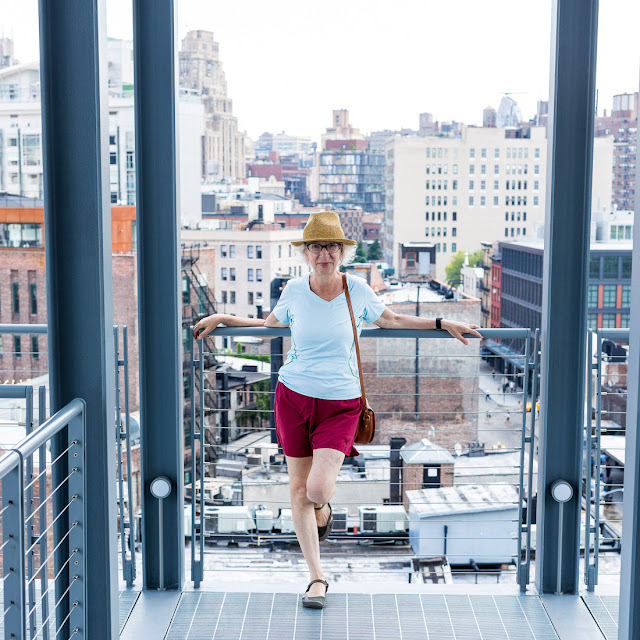 Thanks so much for including me in this fabulous group (I'm loving all the variety of hats and their looks), I love hats more and more as I get older. I just picked up a couple of floppy wide brim 70's-ish hats for this fall/winter. Thanks again! What a great turnout this month! Seems everyone loves straw hats and these photos prove it. That photo of you at Cony Island looks like it was taken in the early 70's. What a great shot! Great collection of hats and women. Thanks for putting this together ladies! 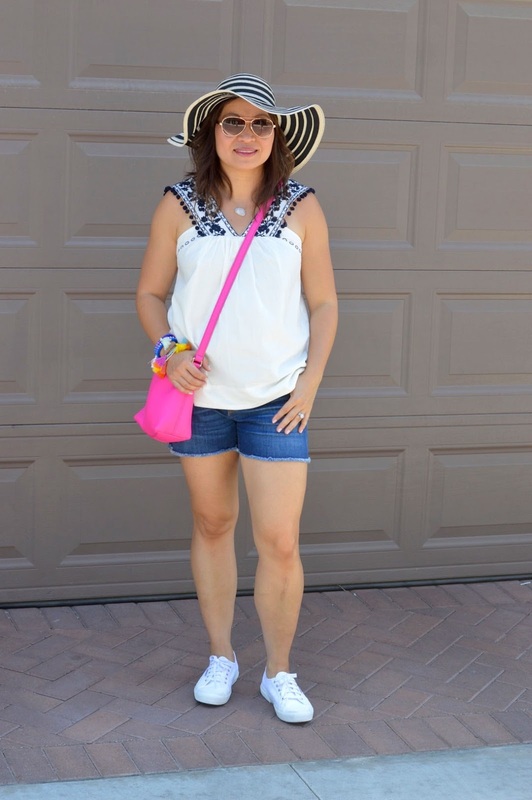 Love your outfit and photo and so many great collection of hats! Great group of women wearing their hats and lovely to see how each one has been accessorized. It's fabulous that you two are so dedicated to keeping this theme of HIWM alive and exciting! I look forward to the next one. Fantastic post my dear! How absolutely fabulous is the photo of Trina, Torie and Molly Doll! on the pink swan!! I am shocked that you of all people don't own a straw hat!! You look absolutely gorgeous in your picture! Such a perfect summer capture with the ferris wheel behind you! I am so excited with the topic for next month! I am already spinning with tassel ideas!! Jill, I commented earlier but it doesn't look like it came over, so I'll try again. Thank you so very much for the kind words you said about me and my cute girls. We do enjoy our pool days of summer. I simply can't believe you do not own a straw hat, just look how wonderful you wear it. I think its a must that you go out shopping for one, I do believe you will quite enjoy wearing it. I absolutely love the one's jcrew carry, in fact the pink one I'm wearing comes from there as well. And, I bet most are on sale by now. Thank you again for all your time you put in to making this such a fun get together. I thoroughly enjoyed seeing all these gorgeous women and how they wore their straw hats. Plus I must say, Tamera is definitely living that life! Lots of wonderful inspiration in these photos! I share your thoughts about Trina's photo! Over the moon, LOVE it! Thanks your very flattering words. My photo was taken in Southwest Florida & the sun gets really hot there, even in the winter months when I am usually there. So, during the day you can usually find me with wearing big sunglasses & many times with a straw hat on. A must on the beach. You definitely have what my mom would have called "a face that can wear hats". Your Coney Island photo is just lovely. I very much enjoyed the feature. Thank you for including me. You look great in your straw hat. Hat's off Ladies, you all look wonderful! Absolutely love your nautical/tropical look! Those little palm trees on your shirt are adorable. And I think the straw hat goes perfectly with your outfit. This month's featured item was a fun one to see on everyone. Such a fun post. I love seeing everyone's take on an accessory.